Awkward Jean the Skiing Machine! That’s right boys and girls… it’s time for another Throwback Thursday story from Awkward Jean. Picture it, winter of 2007. I was in a social club of sorts, the 8 O’clock Club was our name, and it consisted of me and two buddies Mike & Josh. We were a drinking club, a travelling club, a music-loving club. In short, we were like the three amigos without the horses, the three musketeers without the honor, the three stooges without… no, wait, that’s probably a bit closer to what we were like. We got our name from an all-night drink-a-thon. After a party we found ourselves still drinking beer, listening to music and playing washers in the driveway as the sun came up. We made it to about 8am before we called it quits. Hence our name. Ahhh 20’s Jean, she could party. Alas I digress. Suffice it to say the night that named us also bonded us – we became fast friends and over a period of several years in our mid to late 20’s we went on multiple adventures and trips together. Both Mike & Josh are the athletic, sporty type. They were big into nutrition and working out and blah blah blah… Stuff the Jean doesn’t really get into. The three of us couldn’t be more opposite in our views on politics, religion, culture, etc. BUT – we enjoyed a lot of the same (often bad) music and beer. Turns out that’s more than enough in one’s twenties and we were the best of friends for several years. Now, one thing you need to know about Jean is that in my youth I lived in the Sierra Nevada foothills and all us kids spent the winter months up at the local ski resort. In fact, during middle school we went every Wednesday in place of classes during the winter. We had lessons in the morning and free ski in the afternoon. So when Mike and Josh decided our next trip was for winter snow sports I was all in – I mean, hellllooooo I was totally a great skier. I’d done it A LOT. Sure it’d been some time, but wasn’t it like riding a bike? And it hadn’t been THAT long ago… Oh, wait, calculate, carry the one… Ouch. Yeah. I started to realize it’d been about 14 years since I’d gone skiing. But, I’m sure it would be fine. Just like a bike. Although, the more I thought about it, it’d been more than just 14 years, it’d also been about 75 pounds, but… who’s REALLY counting? Again, I was sure I’d be fine, I mean… I never worked out, I got winded climbing the stairs (like one flight), I didn’t own any ski gear… but surely… Oh. Dear. God. Finally the trip arrived. We were in Angel Fire, we were at the ski resort. I was bundled into my giant blue ski coat (think Mama Cass smurf OR Violet from Willy Wonka AFTER she ate the gum) and we were headed toward the ski lift, everything was somewhat working out, though WAY harder than I’d remembered. But my confidence was back. It was all coming back to me and I was suddenly excited – bring on the mountain! I’ve. Got. This. Getting on the lift – SUCCESS! Getting off the lift – NAILED IT! Getting down the hill – Tuck and go… And wow, are my legs supposed to be burning like that? Ugh, how long is this run, my legs are starting to shake. Oh. Dear. Jesus. 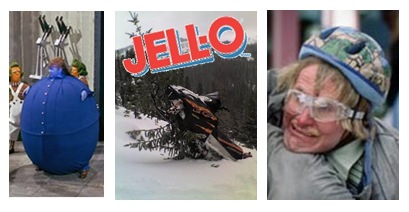 Jell-O – all I feel is Jell-O. I better pull up for a second and just rest. Whew – I can barely catch my breath. This must be the LONGEST. RUN. EVER. Glancing back to the top, expecting it to be pretty much out of focus it’s so far behind me, I realize I’ve gone about the length of a football field. Um. Seriously? Now the negotiations begin to any greater power who will listen. Get me down this hill with functioning thigh muscles and I’ll start working out. I’ll even think about protein and carb ratios and making sure I’m getting enough fiber and leafy greens and, and, I’ll cut out well, not ALL drinking, but I’ll really focus on light beers and vodkas and red wine, but only because it’s good for my heart. I’ll become sporty. Yeah, that’s it… get me down this mountain and I’ll work out, eat right, practice moderation and start being all Athletic Jean! Well, all the negotiating worked. I made it down the mountain. Yep, one run under my belt! The boys were waiting patiently (though annoyed) down at the bottom for me, all eager to hit the next run. I had made it. They both had big grins on their faces and told me what a great job I did, how impressed they were and proud of me. Me: Yeah. I’m pretty awesome. Speaking of… I’m all done here. If you need me, I’ll be in the lodge drinking beer. Take your time; I’ll see you in a few hours. And that was pretty much how Day One went. The Boys: Hey Jean, we were thinking, we might go hit the hill and snowboard in the morning, but then we thought we’d come back here, pick you up and we can all go snowmobiling. How does that sound? You can sleep in and then we’ll just grab some lunch and head out. The sun was getting ready to set and we really needed to get back down the mountain. We started down the path that had been a bit narrow and twisty on the way up, but seemed much more so now that we had tired arms. Mike was in the lead and was starting to race the sun a bit. As I brought up the rear I began to feel that familiar Jell-O sensation, only this time in my arms. The turns got harder and harder as our pace got faster and faster. Suddenly I couldn’t quite manage a turn I was in and… The snowmobile launched right off the edge of the trail – It all happened so quickly I didn’t know what to do, so, I did what I do best – FALL! I bailed right off that machine as it launched into a tree just below the trail. As soon as I landed in the powder and caught myself from sliding further down the hill that rush of adrenaline ceased and I just started feeling shaky all over. That’s about when the boys saw what happened. One was very relieved I was okay, the other showed his relief in another way. A way that involved several expletives and multiple negative comments regarding a) losing the sun b) having to retrieve the snowmobile from a tree while waist deep in powder. I tried to look as adorable as I could to remind him why he puts up with me, but… that’s hard to do when you look like a blue Stay-Puff marshmallow man with frozen snot rivulets running down your face. Fail. The boys eventually got the snowmobile back on the trail and working. We made it back to the trucks – I wasn’t allowed to talk the whole time. I think the only thing that kept Mike from freezing on that mountain was the heat from the anger he was feeling. Finally, as we prepared to head back to the house, I made the grand gesture of offering to buy steaks and beer for dinner. Between the offer and the fact that we were back in the warm trucks, Mike began to relax, tell me he was sorry he was being so grumpy and he wouldn’t let it ruin the night and he was glad I was okay, and yes, the whole thing was a little funny now that it was over… and thank you for offering to buy dinner and drinks. So much for dinner and drinks being on me. And so much for the grumpier of the two cheering up. Needless to say, that was the only time the 8 O’clock Club went on a winter vacation.